To define Coccidia, I will give a quote from the Merck Veterinary Manual, "Coccidiosis is a common and worldwide protozoal disease of rabbits. .... There are 2 anatomic forms: hepatic, caused by Eimeria stiedae , and intestinal, caused by E magna , E irresidua , E media , E perforans , E flavescens , E intestinalis , or other Eimeria spp." So, there's the technical stuff! Coccidia can affect rabbits of any age range, but babies are the most commonly affected. It can manifest itself in a variety of ways. Many times, it will be manifested by diarrhea. But, not always. At times, it can be manifested simply by a lack of growth in the animals along with large bellies. 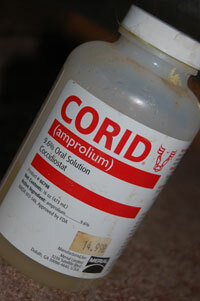 Corid (as seen below) given at 1cc orally for up to 15lbs. Or, 5cc to one gallon of water for 5 days.